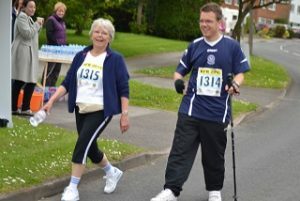 In May this year Steve – and that’s his mum with him – took to the street of the village of Knowle in the West Midlands to participate in the local fun run for charity. Steve has done this as a participant for many years (and his very game mother too) and raised great awareness , not to say a good amount of cash for SoLO – a charity where he volunteers. This year’s fantastic total was £300. Steve did the fun run – or walk as he properly corrected us – of 5.2 miles in 1 hour 57 seconds. Pretty darn impressive, Steve! Next stop 10km?